If you have an equine business, no matter how small or unprofitable it is, you need commercial liability insurance. Period. Here are some of the common reasons we hear about why trainers, boarding stables, and other equine businesses do not have liability insurance, and why those reasons don't make sense. Liability releases are not a substitute for liability insurance, because insurance and contracts play very different roles. Contracts that include liability releases serve a number of valuable functions. They help set appropriate expectations for a business relationship so that the parties are less likely to have disputes. Contracts also provide the parties with legally enforceable rights. Liability releases discourage injured parties from suing and also help prevent them from prevailing in a lawsuit. In contrast, insurance serves other valuable functions. If you are sued and the claim is covered by your insurance policy, your insurer will manage your defense and pay for your legal fees and court costs. Without insurance, if you are sued, you will have to pay for your legal defense out of pocket. The cost of defending an average civil suit easily runs into the tens of thousands of dollars, and an average retainer for a civil litigation attorney in a relatively small case is $10,000 - $20,000. Unless you have a contract providing for an award of attorneys' fees and costs to the winner of a lawsuit, you will have no way to recoup the cost of your legal defense, even if you ultimately prevail in the lawsuit. Representing yourself as a defendant in a lawsuit is simply not a viable option, as the other side's attorney will certainly use your lack of legal expertise to his or her client's advantage, and many judges are impatient with do-it-yourself litigants. Your insurance will also cover the cost of any judgment that is issued against you in a lawsuit (up to your policy limits), provided that the claim that is the subject of the lawsuit is covered by your policy. Without such coverage, you will be forced to pay the judgment out of your own pocket, leading to potential financial ruin. If you cannot afford to pay the judgment and default in payment, the judgment holder can garnish your business' income and seize your business' assets to pay the judgment. If you do business as a partnership or sole proprietorship rather than a corporation, your personal assets will also be subject to seizure and your wages can be garnished to pay the judgment. Not all legal judgments are dischargeable in bankruptcy, either. Equine activity statutes are often misinterpreted as "get out of lawsuit free" laws. 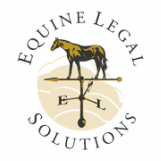 In reality, equine activity statutes are limited in scope and other than serving to discourage some potential plaintiffs, they do not prevent lawsuits at all. Rather, much like a liability release, equine activity statutes provide a potential affirmative defense to claims in a lawsuit. As described in (1) above, defending a lawsuit and paying a judgment (functions typically performed by an insurer) can be financially ruinous. If you are accepting compensation for boarding, training, lessons or other horse-related services, you are in business. It only takes one client to sue you. Horses are very unpredictable and accidents can happen even in the safest possible environment. Even if you have only one client and you feel confident that they would never sue you, their insurance company or family may sue you if they are injured or killed in connection with your activities. Many horse-related businesses are not particularly lucrative, and therefore it is often tempting to go without insurance because it seems cost-ineffective. However, given that the cost of defending just one lawsuit could be tens of thousands of dollars and all of your assets (however modest) are at risk, you really can't afford NOT to have insurance. Closely related to (4) above, this excuse also doesn't make financial sense. If you are not making any money and have very few assets, your financial situation makes it even less likely that you can afford the high cost of defending a lawsuit. Insurance serves to protect the assets that you do have.